Note: This topic applies to the Framlingham Release. 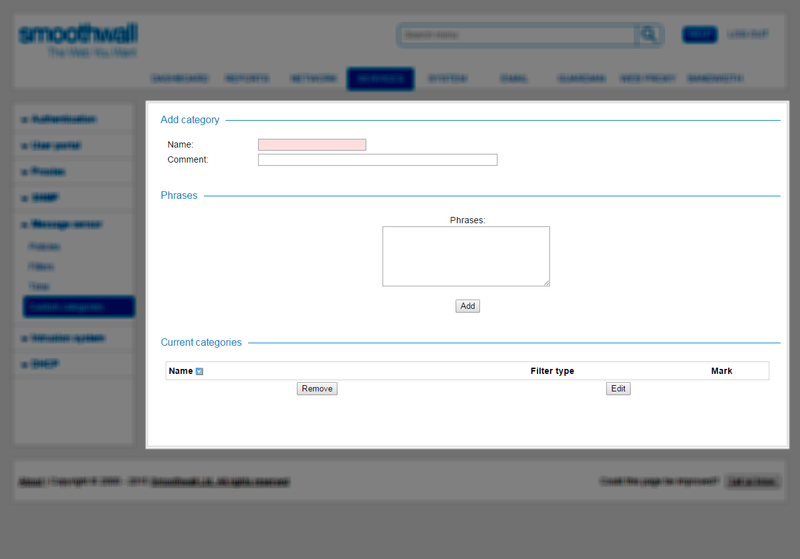 Custom categories enable you to add phrases which are not covered by the default Smoothwall phrase lists. 1. Go to the Services > Message censor > Custom categories page. • Name — Configure a meaningful name for the custom category. • Phrases — Enter the phrases you want to add to the category. (example-exact-phrase) – The Smoothwall matches exact phrases without taking into account possible spelling errors. (example-approximate-phrase)(2) – For the number specified, the Smoothwall uses ‘fuzzy’ matching to take into account that number of spelling mistakes or typographical errors when searching for a match. 3. Click Add. The Smoothwall adds the custom category to the current categories list and makes it available for selection on the Services > Message censor > Filters page. 2. In the Current categories area, select the category and click Edit. 3. In the Phrases area, add, edit or delete phrases. When finished, click Add to save your changes. 4. At the top of the page, click Restart to apply the changes. 2. In the Current categories area, select the category or categories and click Remove. 3. At the top of the page, click Restart to apply the changes. Copyright © 2000-2016 Smoothwall Ltd. All rights reserved.